This morning, FOX News aired B-roll footage of Eagles players kneeling as anchors off screen conducted discussions of the NFL's latest political controversy — the Eagles and their White House visit. The footage strongly implied that Eagles players were protesting the national anthem by taking a knee — but that never happened. 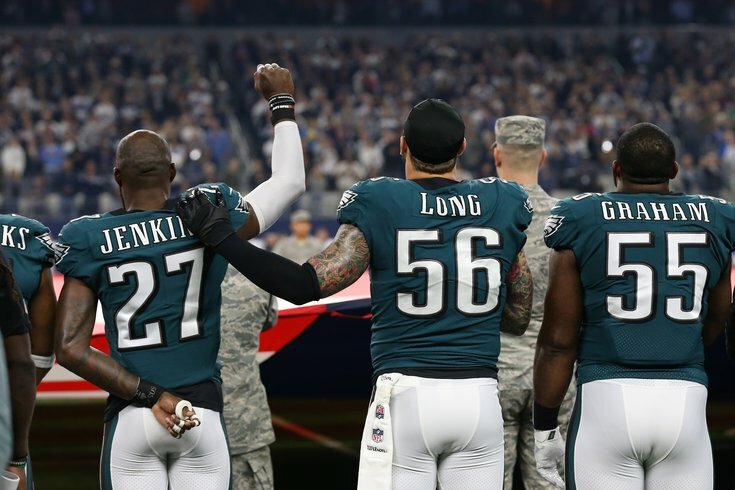 No Eagles player refused to stand during the National Anthem throughout the entirety of their Super Bowl season, with Malcolm Jenkins and Rodney McLeod demonstrating by hoisting a fist in the air during a handful of games, and Chris Long putting his arm on them in a show of solidarity. The news network still aired footage, and images of players like Zach Ertz taking a knee for various reasons, most of them players praying before or after a game – and some of them not even current members of the Eagles. Jenkins also wrote a lengthy response to the bizarre news coverage over the last 24 hours. The misleading broadcast comes half a day after the Trump administration revoked their invitation to the Eagles to celebrate their Super Bowl LII title at the White House. Reports say as many as 82 members of the team and staff were planning to skip the event on the South Lawn, with the administration citing the NFL's new anthem policy as the catalyst (a policy strongly lobbied for by the Trump administration). The players, however, maintain that their hesitation or refusal to appear with Trump dealt with his own conduct as president. In the face of so much political attention being paid to the Eagles and the NFL, it's hard to determine which is worse: unknowingly misrepresenting the Eagles' beliefs, behavior and conduct? Or doing so knowingly and defaming an entire team of people with diverse opinions. Many Eagles players, if not all, consider the national anthem a very patriotic and important tradition before a football game. Many players, off the field, raise money and spend time helping minority members of communities and the United States military. But instead, Ertz and other Eagles were painted as unpatriotic and selfish. FOX News took down all its tweets this afternoon, looking to cover their tracks, but the fact remains — instead of showing some of the hundreds of photos of the Eagles after winning the Super Bowl, or showing pictures of Jenkins raising his fist or players actually playing football for the Eagles, they chose to misdirect their viewers by showing players taking an unrelated knee. An apology is easy after millions of viewers are led to believe a falsehood, and FOX News took advantage of an opportunity to further rift the political discourse in this country. For that, there should be some kind of accountability.